It was over 20 years ago when I ordered my first UFC event on Pay Per View (more accurately, my parents ordered it for me given that I was 16 at the time). Tuli, weighing in at 410 lbs would need to fight in the super-heavyweight division with Gordeau qualifying for heavyweight at 216 lbs. The first weight class mismatch of the night. Gordeau’s Gi pants are prohibited as it Tuli’s outfit. Gordeau’s bout winning roundhouse kick to Tuli’s head while grounded would result in disqualification. Tuli appears to have forgotten his mouthpiece as is evidenced by his tooth flying out of his mouth. No weight class issues as both qualify for the heavyweight division with Rosier just sneaking in at 265 lbs. It is unclear whether either competitor’s handwraps would pass Athletic Commission scrutiny. Rosier’s strikes to the back of Frazier’s head would not be tolerated. These are followed by an illegal 12-6 Elbow. Frazier hits Rosier with a knee strike to the groin. Frazier holds Rosier’s hair while throwing more low blows. While in a headlock Frazier appears to gouge Rosier’s face. Frazier throws a knee to Rosier’s head while grounded. Rosier wins the bout by striking the back of Frazier’s head followed by serial stomps to a grounded Frazier. All while grabbing the fence for extra leverage. Another bout where the winner would be disqualified under modern rules. Gracie, weighing in at 180 lbs would need to fight at middle weight with Jimmerson’s 196 qualifying him for light heavyweight. 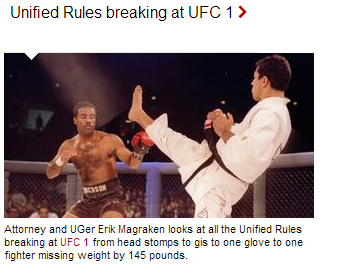 Gracie’s gi, of course, would be prohibited and what more can be said about “one glove” Jimmerson’s choice to don a single boxing glove that has not been said already. Additionally his footwear would not be allowed. This is the first bout of the tournament that did not have any fouls in the active competition. A quick, clean submission victory. Both fighters weigh in comfortably in the heavyweight division. Shamrock’s speedo style trunks would not be allowed. Both Smith’s and Shamrock’s wrist wrapping method would run afoul of current practices. Smith appears to throw some heel kicks to the kidney while in guard. Shamrock responds with a headbutt. Other than these transgressions the bout is fought largely in compliance with modern rules. No weight class issues with this match up as both would qualify for the heavyweight division. Gordeau throws a headkick to a grounded Rosier. From there the referee is slow in responding to a barrage of elbows from Gordeau allowing him to get in a final stomp to a grounded Rosier before the stoppage. Although the bout should have been stopped after the legal elbows, the illegal stomp was the final blow making this the third bout which would have stopped via disqualification under modern rules. We start with yet another weight mismatch with the middleweight Gracie against the Heavyweight Shamrock. Gracie throws a barrage of heel kicks to Shamrock’s kidney from guard. Other than this the Gracie v. Shamrock bout is largely compliant with the Unified Rules. Again we have a mismatch in weight classes with the middleweight Gracie facing the heavyweight Gordeau. Gorddeu grabs the fence in an attempt to stop a takedown. Gracie throws some headbutts before taking the back and then commits a double foul with a headbutt to the back of Gordeau’s head. That wraps it up. I’m sure there are many other transgressions under modern rules that missed my eye. Any other observations are welcome! Update: MixedMartialArts.com did a great job republishing this article complete with photos and GIF’s. I highly recommend re-reading this article there!